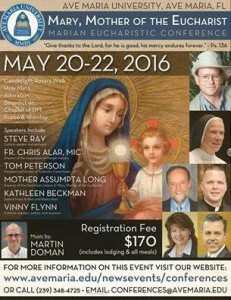 Join us in Ave Maria Florida if you can. 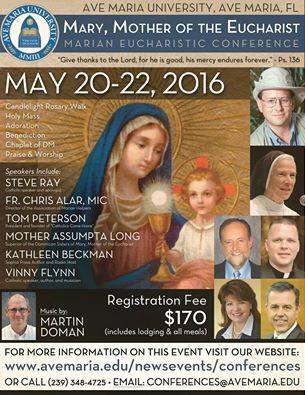 I will be giving two talks on Mary, one on Friday, May 20 and Part 2 on Saturday, May 21. We will go through her life from her birth in Jerusalem, her meeting with Gabriel in Nazareth, the Visitation (Ark of the New Covenant), Bethlehem and a “Day in the Life of the Holy Family” in Nazareth. Then to the wedding in Cana, the crucifixion in Jerusalem, the Upper Room, Ephesus with St. John her new “son,” and then back to Jerusalem and eventually heaven where she is the Queen and Mother of the Church. Hope you can join us — but if not, I have a part of this presentation on CD or MP3 here. I also have a DVD documentary “Mary, Mother of God” which was filmed on location following the life of the Blessed Virgin.